Kodak EasyShare EX1011 Software and Digital Frame Firmware Downloads for Microsoft Windows and Macintosh Operating Systems. This firmware version provides the following improvements: on-screen notification of new pictures. The Picture Mail feature lets you view pictures from KODAK Gallery members right on your frame, within two hours of being sent; receive automatic firmware upgrades when new versions become available; organize and view your pictures and videos by date or file name; store more pictures on your frame with automatic resizing; enhanced look and feel (highlighting on Home screen, thumbnails, check marks, and screen titles). 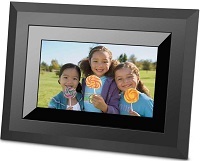 Click here for Kodak EasyShare EX1011 Digital Frame Manual or User Guide. This download page includes the EasyShare EX1011 Software, Digital Frame Firmware and EX1011 Manual.